We're on a bit of a pumpkin roll here at Cook with Sara - and that's nothing to apologize for, in my opinion. Crepes, danish and muffins, oh my! When I received my assignment for Secret Recipe Club this month, I was glad to see that Chelsey is equally pumpkin crazy as I am. 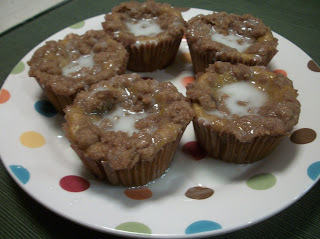 There were lots of great things to choose from on her blog, Mangia, but ultimately I landed on this recipe for Pumpkin Coffeecake Muffins. And I'm glad I did. Chelsey's recipes feature ingredients for gluten free, nut free, dairy free, paleo, etc. I don't need to cook and bake that way, so I adapted this recipe a bit. If you have dietary restrictions, you should definitely check out all of Chelsey's great recipes. And if you don't have restrictions, you should still check them out! And in any case, make these great muffins. Get more ideas at Mix it Up, Inspiration Monday, Inspire Me. In a large mixing bowl, whisk together the oil, pumpkin, egg, milk, sugar, maple syrup, and vanilla until smooth. Stir in the flour, baking powder, baking soda, cinnamon, nutmeg, ginger and salt. Divide batter between 12 paper-lined muffin cups. For the streusel, in a small mixing bowl, combine the brown sugar, flour and cinnamon. Cut in the butter using your fingers, a pastry blender or two forks until the butter is incorporated. Sprinkle the streusel over the muffin batter. Bake at 350 for 25-30 minutes, or until a toothpick inserted into the center of each muffin comes out clean. For the glaze, whisk together the powdered sugar and milk until a good consistency is achieved. Drizzle over the cooled muffins. Serves 12. Thank you Sara! I am sooooooo glad you made these muffins, they are my fave. Can't wait to make them soon. These look so good! What a fun Thanksgiving muffin. These sound like the perfect treat to take to my in-laws for our post Thanksgiving brunch on Friday. Thanks so much for the inspiration and a great new recipe to try! 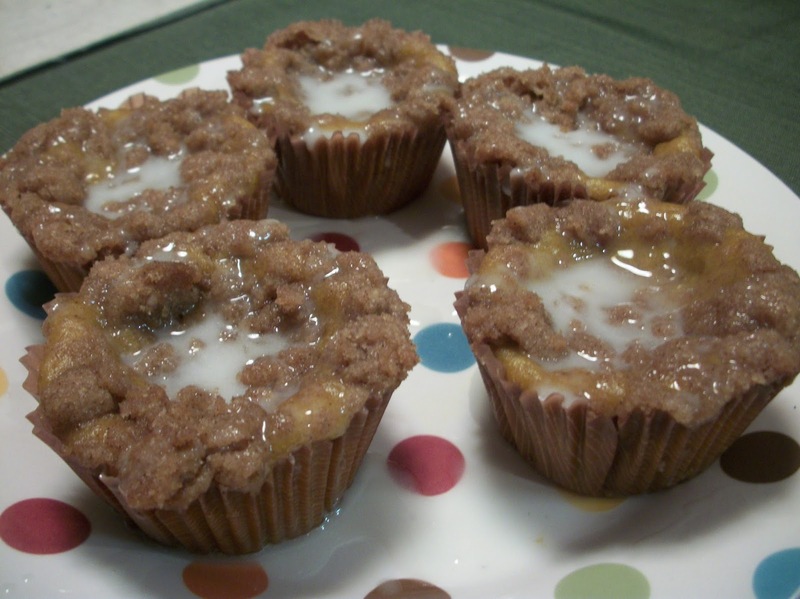 I'd love to have one, or two :) of these muffins with my morning coffee. They look so good. YUM! I love muffins and these look delicious. You can never go wrong with pumpkin. Great SRC choice! 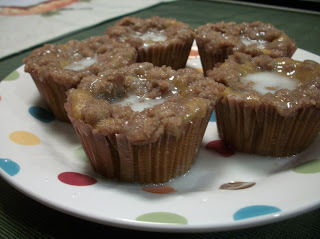 pumpkin muffins are great, but that glaze takes it over the top! yum!